Chili: Gene passed away on June 2, 2017. He was predeceased by brothers Gerald & James Derleth. He is survived by nieces & nephews Paul (Janet), Peter, Kim, Scott & Reed. Gene was a Korean War Veteran. Services & interment private. Kindly consider donating to School of the Holy Childhood, 100 Groton Pkwy, Rochester, NY 14623 in his memory. North Chili: Age 33, passed away suddenly on April 23, 2017. Ravi is survived by his wife Amanda (Anthony); children Madison and Gavin; his parents Mike and Shirley (Ramsaran); his sister Ravina (John) Miles; nephews London and Hunter; mother-in-law Deborah Anthony (Shields); father-in-law Alfred Anthony; sister-in-law Katelyn (Justin) Anthony; brother-in-law Sean Anthony; several aunts; uncles; cousins and many dear friends. Ravi was employed at Paychex.Calling hours will be held on Friday, April 28 from 4-7 pm at James Gray Funeral Home, 1530 Buffalo Rd. In lieu of flowers, please consider donating to Madison and Gavin's education in Ravi's memory (P.O. Box 275, North Chili, NY, 14514). Gates: Brent passed away on April 20, 2017. He was predeceased by wives Irene Canfield & Janet Canfield. He is survived by children John (Margaret) Canfield, Scott (Robin) Canfield, Mary (Jerry) Sojda, James C. Snyder , Robert (Joan) Snyder; grandchildren Michael (Megan), Brian, Christine Canfield, Amy (Joe) Maggio, Rebecca (Jason) Charpinsky; several great-grandchildren. Brent was a friend to everyone. Born in Prince Edward Island, Canada, he moved to Rochester in 1941. He retired from Eastman Kodak Company. Family & friends may call Wednesday, April 26 from 4-6 pm at the James R. Gray Funeral Home, 1530 Buffalo Rd. In lieu of flowers, kindly consider donating to Lifetime Care Hildebrandt Hospice, 3111 S. Winton Rd, Rochester, NY 14623. Scottsville: On February 19, 2017, age 73. Robert was predeceased by his parents Robert and Elethia Montgomery; brother Roosevelt Montgomery; sister Judy Kay Kennedy (Cleveland). He leaves to cherish his memories his wife Alicia Montgomery; children Marnita Jones (Mitchell), Tammy Montgomery-Clark (Bernard Jr.), Robert "Robbie" Montgomery, Robert B. Montgomery (Katie), Heriberto Burgos, Leonardo Burgos, Alicia Burgos, Jaime Burgos (Matthew Reynell); 20 grandchildren; 19 great-grandchildren; many family and friends especially Cleo Butts; 3 brothers Isaiah Montgomery (Gail), Samuel Montgomery (Pamela),Terry Montgomery (Rashida); 4 sisters Frances Campbell (Willie), Sheila Stephens (Sherman), Sharon Patmon (Willie) and Audrey Deneal (Jimmy). Bob retired from Eastman Kodak Company. Family and friends may call Friday, February 24 from 4-7 pm at the James R. Gray Funeral Home, 1530 Buffalo Rd. where a Prayer Service will follow visitation. Private burial in Holy Angels Cemetery. In lieu of flowers kindly consider donating to Scottsville Athletic Association, PO Box 183, Scottsville, NY 14546 (www.scottsvilleathletic.org) in memory of Robert Montgomery. Rochester: Dorothy passed away on December 28, 2017. She was predeceased by her sister Phyllis Schied. She is survived by her sister Shirley Gehrig of Florida; nieces Karen (John) Hall and Victoria Giorgione; grandnephews Richard (Casey) Hall and Jared (Maggie) Hall. Dorothy retired as a commercial artist from Eastman Kodak Company. Family and friends are invited to her Graveside Service on Saturday, December 30, 2017 at 10 am at Grove Place Cemetery (corner of Chili Avenue and Marshall Road). Kindly consider donating to the Humane Society @ Lollypop Farm, 99 Victor Road, Fairport, NY 14450 in Dorothy’s memory. Spencerport: Nancy passed away on December 27, 2017. She is survived by her parents George & Nancy Steger; sister Mary (Walter) Cady of Quebeck, TN; brother George (Christine) Steger; nieces & nephews Krystal Alderson, James Alderson, Kathleen Steger & Daniel Steger; several aunts & uncles & friends at School of the Holy Childhood. Family & friends may call on Tuesday, January 2, 2018 from 1-3 and 5-7 pm at the James R. Gray Funeral Home, 1530 Buffalo Rd. Nancy's Funeral Mass will be held on Wednesday, January 3, 2018 at 9 am at St. John the Evangelist Church, 55 Martha St., Spencerport. Burial to follow in St. John’s Cemetery. Kindly consider donating to the School of the Holy Childhood, 100 Groton Parkway, Rochester, NY 14623 in Nancy’s memory. Gates: Gale passed away peacefully on December 3, 2017 at the age of 82. He was predeceased by his loving wife Mary Jane & son Jerry. He is survived by his devoted daughter Christine (Thomas) Andreassi; loving grandsons Anthony & Nicholas Andreassi who were the joy of his life; sisters-in-law Jacqueline Bissell, Jeanette (David) Fulton; nieces; nephews & several close friends. Gale was an avid sports enthusiast which he shared with his grandsons through the years. He especially enjoyed playing golf with his friends at Pinewood Country Club & was a retiree of Kodak. We wish to express our deepest gratitude to Oncologist & Radiologist Dr. Kamath & Dr. Dhakal; special nurse & friend Julie Pelow & Journey Home for providing Gale with excellent care. Friends are invited to his Funeral Mass Saturday, December 9, 2017 at 9:30 am at St. Theodore Church, 168 Spencerport Road with a reception to follow. Kindly consider donating to Journey Home in Gale’s memory. Chili: Tim passed away on November 28, 2017. He is survived by his devoted & loving wife Susie; children Timothy J. (Meredith), Lawrence (Veronica); Lurleen & Heather Dougherty; grand & great-grandchildren; sisters Margaret Ann Fries, Marileen (Daniel) Titus; brothers George (Toni), Dennis (Susan); nieces; nephews & cousins. Tim retired from Eastman Kodak Company. Family & friends are invited to a Celebration of Tim’s Life on Monday, December 4 at 1 pm at Chili American Legion Post 1830, 450 Scottsville-Chili Rd. Burial in Westside Cemetery at the family’s convenience. Kindly consider a contribution in Tim’s honor to a worthy military-related program. Chili: Jack passed away on November 18, 2017. He was predeceased by his wife Shirley. He is survived by his sister Judy Cobb; brother Daniel McEntee; children Janet (Robert) Juarbe, Scott (Kari Lee) McEntee, Dennis (Lori) McEntee, Curt (Amy) McEntee and Shelly Brockway; 11 grandchildren; 5 great-grandchildren; nieces and nephews. Jack retired from Bausch & Lomb and was a longtime SAL, Chili American Legion Post 1830. Family and friends may call on Tuesday, November 21 from 4-7 pm at the James R. Gray Funeral Home, 1530 Buffalo Road. Please join Jack’s family on Wednesday, November 22 from 1-3 pm for a celebration at Chili American Legion Post 1830, 450 Scottsville-Chili Rd. Burial in St. Pius X Cemetery at the family’s convenience. Kindly consider donating to the Rochester Area Multiple Sclerosis Society, 1000 Elmwood Avenue, #900, Rochester, NY 14620 in his memory. N. Chili: Jerry passed away on November 14, 2017. 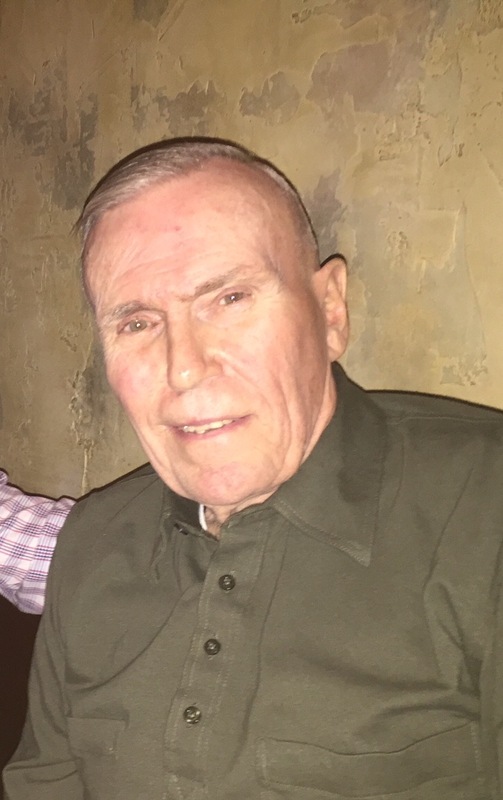 He is survived by his devoted wife Marjorie Ann Wolters; daughters Linda (Tom) O’Neill and Cindy (Don) Kasper; 5 grandchildren; 1 great-granddaughter; sisters Ilean Goodwill and Dorothy Holland; nieces; nephews and cousins. Jerry was a US Army veteran and POW of the Korean War, for which he was awarded the Purple Heart. He leaves behind his best friend Joe Genova and many friends he has made at the POW and Combat Vets groups over the years with a special thank-you to Dr. Pete. Family & friends may call at the James R. Gray Funeral Home, 1530 Buffalo Road on Saturday, November 18 from 11-1 pm with words of comfort to follow. Burial private in N. Chili Rural Cemetery. Kindly consider donating to a charity of choice in Jerry's memory.